This is a simple activity which can be done by children of any age. 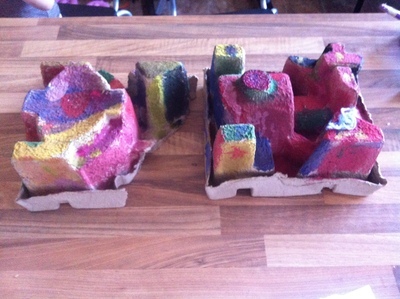 Your kids can use their creativity to paint their very own city made out of recycled box packaging. Once it dries there is the opportunity for extended play as these hardy materials can withstand quite a lot of use. Kids can create characters and stories to populate their cities, using some of the more interesting shapes as castles and towers. They are only limited by their imagination to how much fun they can have with this. It is also a good way of giving the kids something to do while you work out how to use or play with your new appliance! The inner packaging of appliances. In this case we used the packaging that came inside a vacuum box, but you could just as easily use that from your next blender, navigator etc. 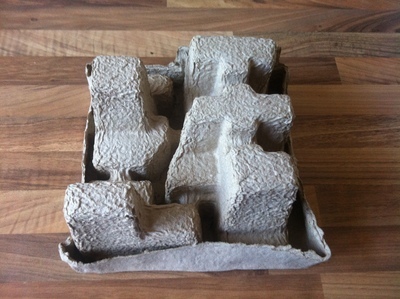 Start by separating the packaging out, getting rid of plastics and keeping the bits that are made out of sturdy cardboard. Arrange these so that their most interesting shapes appear and if you look closely you will already see a city in the making. 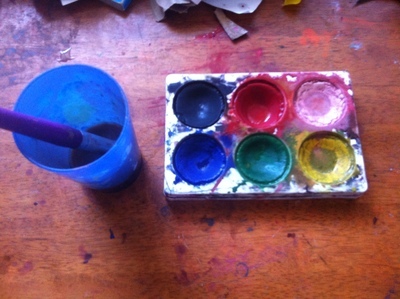 Take your favourite paint (we used water colours because we were doing this inside on a rainy day and the clean-up is quicker, but you could just as easily use other types of paints). Paint the shapes in different colours until a city appears. Allow to dry and then these hardy toys can be used for hours of extended play.